I fell in love in the summer of 2005. Fell in love… with the penguin that is after watching the documentary, “March of the Penguins”. I don’t want to ruin it for those who have not seen the movie, but I highly recommend watching it with your family this Christmas. That was my inspiration to go to Antarctica or South America and that dream finally came true. 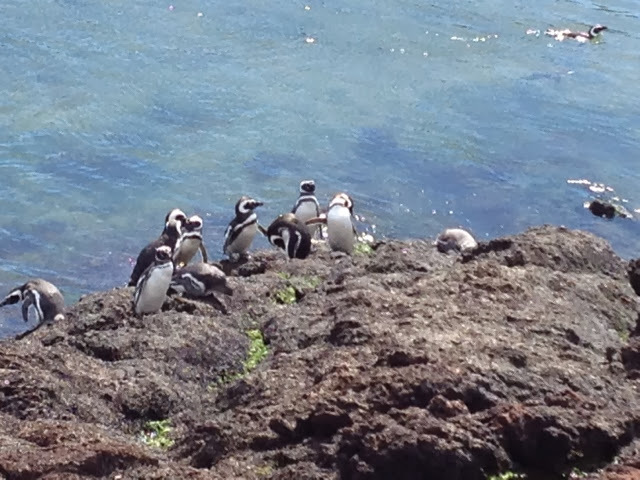 We are Magellanic penguins who live on the shores of South America. In winter, we leave our breeding colonies for warmer waters in the north. Due to our inability to fly, we nest in burrows. We are monogamous and remain together with our mate for so many years. Our males take care of our chicks, while us females migrate long distance searching for food. Our food consists mainly of fish - we love krill, squid, hake, sprat and hagfish. · We are perfectly designed for life in the sea. Jumping from the water which enables us to both take a breath and save energy when traveling near the surface. Being dark above and light below is a form of camouflage, which help us hide from both our predators and prey in the water. Sea Lions are our most formidable predators with fearsome canine teeth. , Sadly, we are declining due to a combination of commercial fishing, and oil pollution from the deliberate discharge of oily ballast water by tanker traffic.